Page 1 What Is The Law Of Attraction? This is the most important step out of all of the 5. You need to focus on a specific goal that you wish to achieve. A goal you can visualise and focus on. Doing this will help you work through the other steps in The Abundance Code course. Step 2: Activate Your Goal With Powerful Emotions While In A Relaxed State Of Mind. When you attach strong and powerful emotions to the goal you’re trying to achieve while in a relaxed state of mind, the chances of success in manifesting your destiny increase. Visualising your completed goal in the here and now, as if you have completed it already tells your mind it is a goal that is achievable and your mind will be able to show you the best route to completing that goal. This is a personalised plan of action tailored just for you that includes passion and excitement needed to achieve your goal and reaffirms your commitment at the same time. In this step you need to work with and connect with others to help you stay on track and make any adjustments to your plan to help you reach your goal. With The Abundance Code course, there is an element of work to be done. It isn’t a simply read or listen and forget product. It is important to jot down key concepts of the material as you come across them. Also, more importantly, write down your goal so you have something physical and tangible to show and tell yourself about the goal you’re trying to achieve. Writing down your goal and telling it to yourself serves as a commitment to your mind / subconscious as to what you want to achieve. When you take the time to write this down and tell yourself this goal, your mind should help you find the best path to this goal. 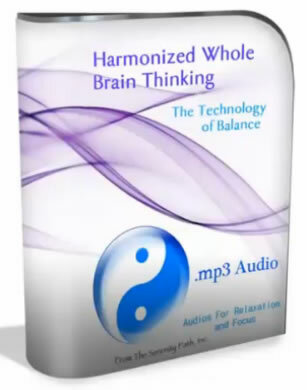 One of The Abundance Code bonus you receive is an MP3 designed to help calm and relax your mind. It is called The Harmonised Whole Brain Thinking. This is a 7 minute audio file and you use this with the goal you wrote down. After writing this goal down you need to set some time aside daily. It takes just 7 minutes a day and ensures you keep reinforcing this goal in your mind, and to keep yourself focussed and on track towards your goal. You use your 7 minute Abundance Code bonus, “The Harmonised Whole Brain Thinking” everyday for 21 days. If you want to unlock the potential of The Abundance Code you will need to commit to this investment. One of the things I thought was helpful while listening to the harmonised whole brain thinking audio was to focus on slow, relaxed breathing and having an image of successfully completing the goal. I pictured what I’d expect to see and feel and also how completing this goal would benefit my life. “The Harmonised Whole Brain Thinking” Abundance Code bonus is downloadable from the Members Area of The Abundance Code website when you join. When using the abundance code, it isn’t just the visual image of you completing the goal in the present moment that’s important. You need to also attach the feelings and emotions associated with you achieving your life goal too. Applying these feelings and emotions can give your subconscious mind the extra boost to carry you through. Your plan is tailored to you. What works for you isn’t going to work for someone else because of your own unique thoughts, feelings, emotions and visualisations when manifesting your life goal and manifesting your desires.